More Than Paper has always prided ourselves on being ahead of the curve when it comes to trends and spotting the next big thing in gifts. Last summer, it was the rainbow loom kit which to this day is one of our best selling products on our site. Kids are crazy for looming! But what's next? What's hot for summer 2014? Of course, we have it for you! This season, expect kids to go crazy for personalized socks for camp. Choose from a variety of styles, colors, and ways to personalize. Kids will love these personalized socks! They come in sets so you get 6 pairs for $49.95, additional pairs are available. Another cool item that we have found are nail stickers. Much easier than getting your nails painted ornately, these stickers allows kids and teens to get funky and fun with their nails. Stickers stick on easily and last very well. To extend the wear of the stickers, you can paint a clear coat of polish over them. The loom kits are still hot for 2014! Our personalized loom kit comes with the loom, a mini loom, a bag of approximately 50 c-clips (what you use to fasten the bracelet) and over 2,400 bands in a variety of 8 colors - all which fit in a personalized box that keeps everything neat and tidy! It's clear that this craze has not passed yet! Stay tuned for another hot new rainbow loom-related product coming out in time for Visiting Day gifts! There you have it. 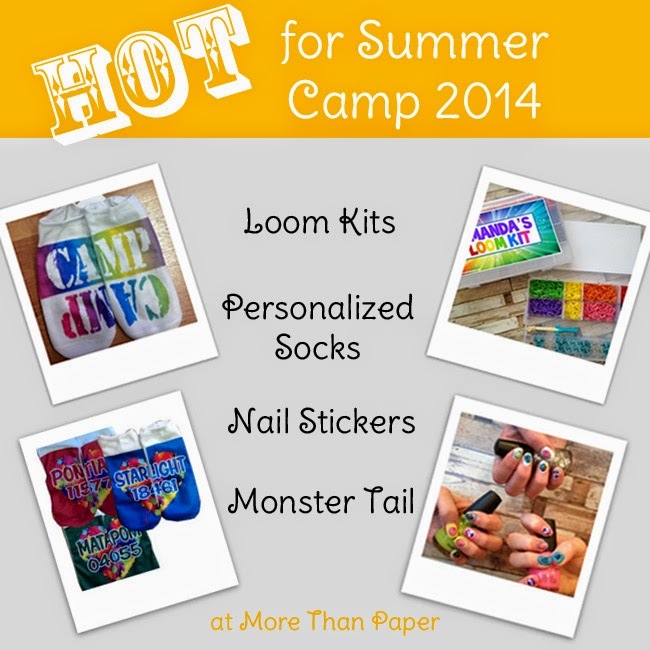 3 HOT summer gifts for camp or for any occasion this summer! Visit our website to see more.